It’s that time we love to hate (at least in the U.S.A.). Our kids are heading back to school. That means traffic will pick up and so will busy schedules. Back to school isn’t all bad, it’s a good thing if we get past the small items that make it frustrating and inconvenient. What if we together redirect our focus. Here’s a “BeTheSohrs” topic to help make “back-to-school” more enjoyable. 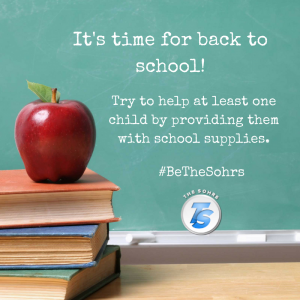 Try to help at least one child by providing them with school supplies. You’ll never know how much it means to a child to have the supplies they need or even want as they return to school form the summer. It’s back-to-school time, but more important it’s our time to do what we, Christians to do best. Make a difference; let’s BeTheSohrs! Share on Facebook, and Twitter.